Fly Geyser, also known as Fly Ranch Geyser is a small man-made geothermal geyser that is located approximately 20 miles north of Gerlach, in Washoe Country, Nevada. This was created accidentally in 1964 from a geothermal test well inadequately capped. Its glorious color of multiple hues of green and red that adds to its fascinating appearance is due to thermophilic algae thriving in the extreme micro-climate of the geysers. But a view from afar is all you can attempt because the place is not open to public. There is a high fence and a locked gate with several metal spokes on the top to keep trespassers out. Though several organizations have tried to purchase the land for conservation, and make it open to the public, the owner resolutely refused. 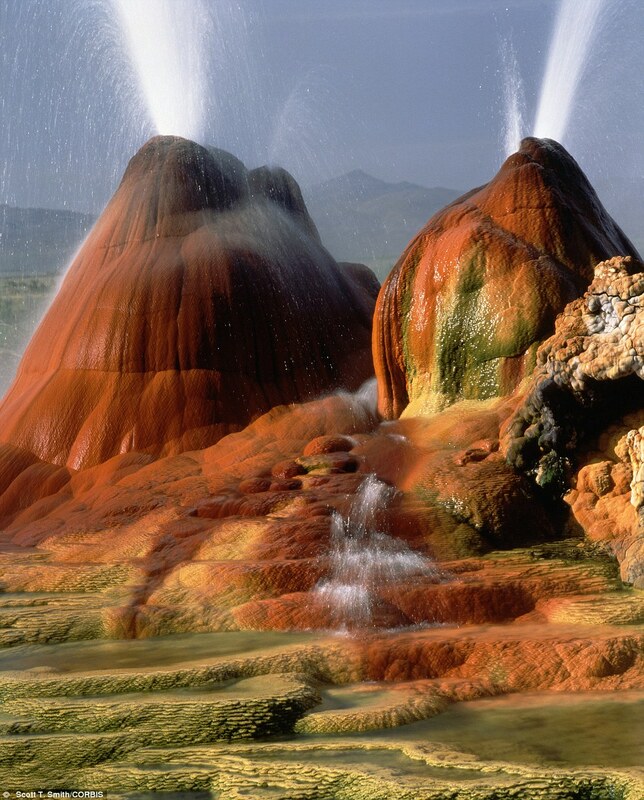 The Geyser Hot Springs in Black Rock Desert, in Nevada in the U.S.
White Desert (known as Sahara el Beyda, with the word sahara meaning a desert) is the main geographic attraction of Farafra. It is located 45 km north of Farafara. 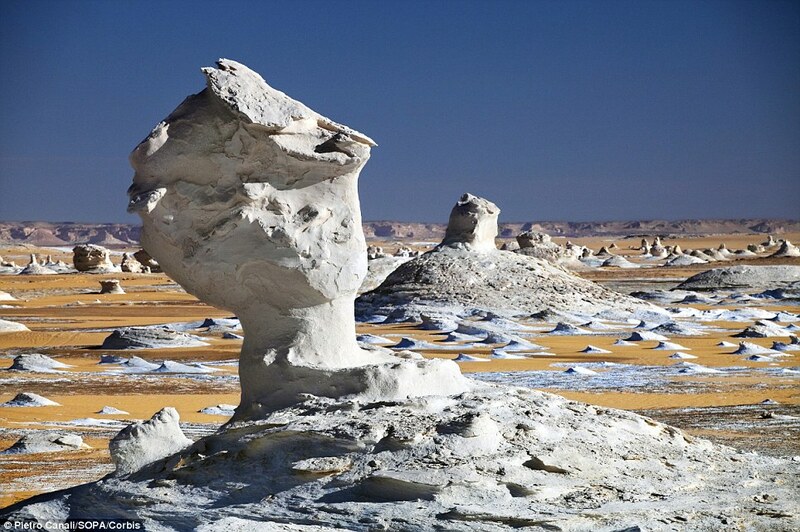 It has a white, cream color and has massive chalk rock formations that have been created as a result of occasional sandstorm in the area. The Farafra desert is a typical place visited by some schools in Egypt, as a location for camping trips. The Desert was also the featured location in the music video for "Echoes" by the Klaxons. 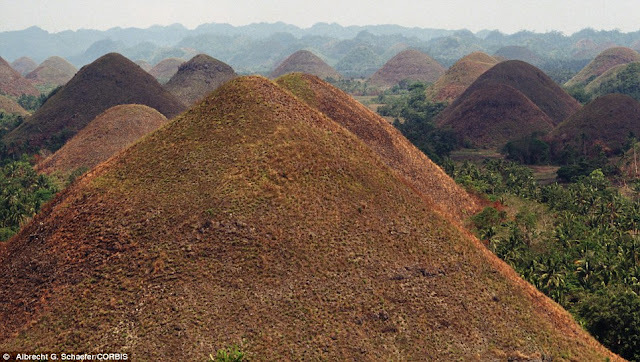 The Chocolate Hills is an unusual geological formation in Bohol province, Philippines. There are at least 1,260 hills but there may be as many as 1,776 hills spread over an area of more than 50 square kilometres. They are covered in green grass that turns brown during the dry season, hence the name. They look like giant mole hills. Others even describe them as "women's breasts". The Vermilion Cliffs are the second "step" up in the five-step Grand Staircase of the Colorado Plateau. Reddish or vermilion-colored cliffs are found along U.S. Highway 89 and U.S. Highway 89A near Kanab, Utah (and near Navajo Bridge in Arizona). These are made up of deposited silt and desert dunes, cemented by infiltrated carbonates and intensely colored by red iron oxide and other minerals, particularly bluish manganese. In the spring, after a good winter rain, the valley between Highway 89 and the Vermilion Cliffs will be covered with a carpet of desert mallow and other spring flowers. It is such a wonderful place to explore! 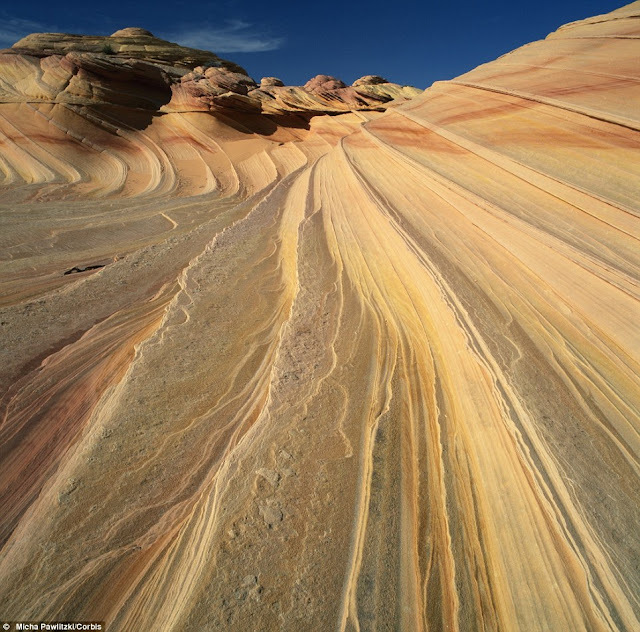 The Vermilion Cliffs of the Paria Canyon wilderness in the U.S. 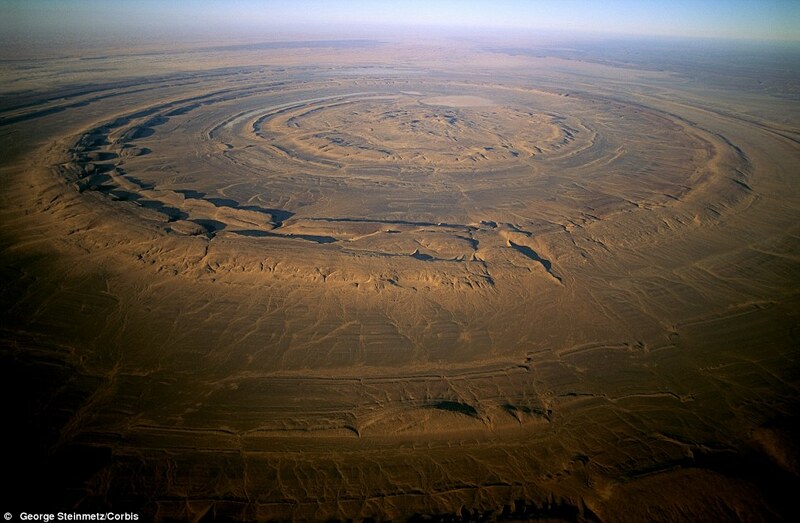 The Richat Structure, also known as the Eye of the Sahara and Guelb er Richat, is a prominent circular feature in the Sahara desert of west–central Mauritania near Ouadane. This structure is a deeply eroded, slightly elliptical, 40-km in diameter, dome. The sedimentary rock exposed in this dome range in age from Late Proterozoic within the center of the dome to Ordovician sandstone around its edges. It has attracted attention since the earliest space missions because it forms a conspicuous bull's-eye in the otherwise rather featureless expanse of desert. It is initially interpreted as an asteroid impact structure because of its high degree of circularity; it is now argued to be a highly symmetrical and deeply eroded geologic dome.